I totally agree with you! That would be a good idea. Yes, the bare minimum would be something like that. Is so frustrating trying to show your effort to someone else in the game. Who cares what you did last season when you are at level 35... its 1/35 of your time spent in the game... Was the lamest downgrade from the old TE versions. 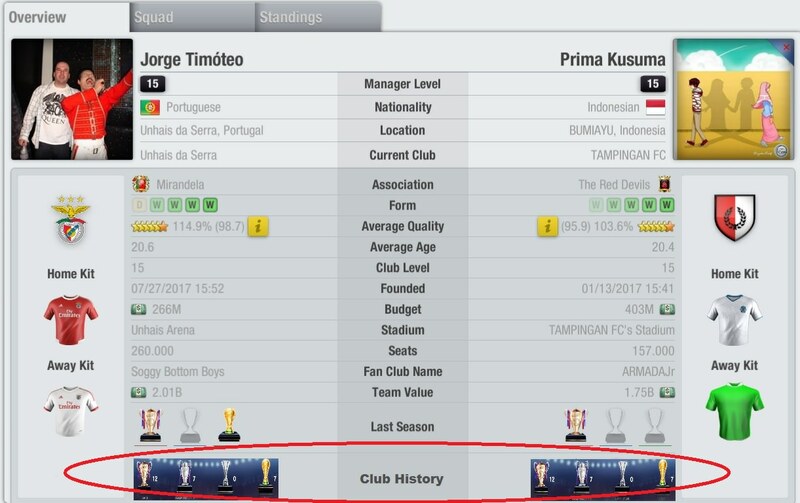 Actually is a great idea, if they do not watch to add back the Club Trophy room this can be a good solution! by being able to see our achievements, this will make us more active in pursuing ... or if it has been obtained. even this can be one way we socialize more. will be able to make the players of this game very active playing. I was just thinking of something. Maybe it will not be able to happen but if maybe we could get separated in regions or servers and then there are about 3-4 league tiers in each region and you battle to reach the top tier of your region. Teams at the bottom of each tier get relegated to lower tier. And the top 8 teams of the top tier get a chance to face other teams from different servers or regions in the Champions League or Super Cup. So this way maybe we'd get to keep our group of players a little longer like in national teams. Because you sometimes get a good set of players and have to switch almost half the next season because of one less star. Docela rád bych v lize uvítal nadstavbu. Můžeme vidět v Rakouské, Belgické, České, atd..